I actually didn't meet Shirley, she met me. It's rather daunting walking up to someone and asking them what their name is, let alone what their story is. Shirley solved that problem for me though by coming up to me and striking up a conversation. I wasn't intending on talking to her, or meeting her for that matter, but she seemed pretty keen on talking to me and for that I was very grateful. Shirley introduced herself to me as I was browsing through the racks in a small little op shop in my local town. She said hello just as I was picking up a gorgeous floral maxi that I found hidden away behind an old coat. She called me 'poppet' which I loved and shook my hand and continued to tell me how great it was that we both had names starting with the letter "S" and how funny it is that we both love being called by our nicknames - Shirl and Sam. I loved how she found such enjoyment in the simple things. Shirl has been volunteering in the little op shop for over 7 years and she said she does it because she enjoys meeting people, people of every kind of nature. Her smile proved to me that she loved what she did. It made me happy knowing that there are people out there who truly have an appreciation for their life. She continued to tell me that she thought it was remarkable that I was considering altering the dress I just found, and how it is so rare to find "young folk these days" using a sewing machine. This then sparked a brilliant conversation of just how DIY savvy this woman was. If only Pinterest was around back in her day, the DIY projects of hers would be all over the web. She told me stories of all the weird and wacky projects she undertakes with items in the op shop. For example she has made knee-pads out of old bras, gloves out of socks and umbrella covers out of men's ties. She truly is a DIY wonder woman. 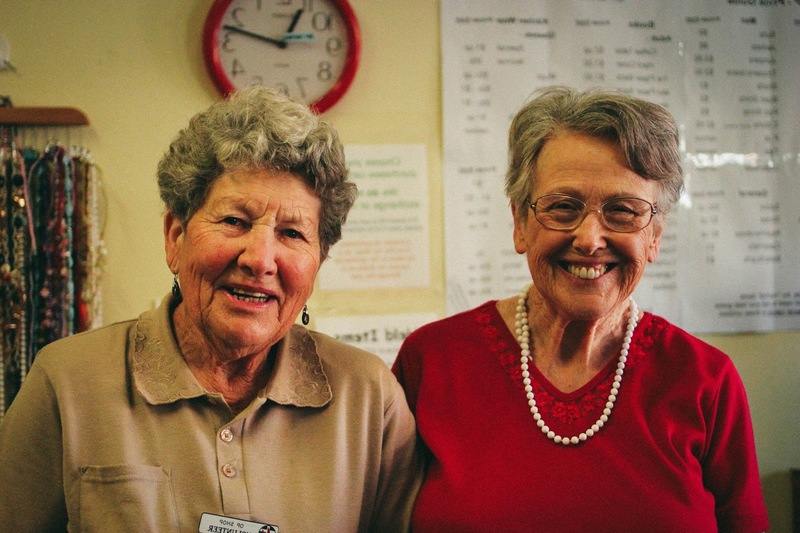 The photo below is of Shirley (left) and her good friend Margaret (right) who also volunteers her time at the op shop. Shirl didn't want her photo taken without Margaret, because "together, we are a team" - How could I say no to that. I look forward to talking to Shirl again on Friday when I drop off this photo to her. Her happiness is truly radiant and encouraging. I hope I have that attitude when I am her age. How precious. This has to be the sweetest post I've read this morning. I love that you are doing this project. It's an awesome idea. Can't wait to check back and see what other people God brings into your path. Love the story behind the picture. Totally inspiring. They are two seriously adorable women.